I really love the tradition of sending holiday cards to our friends and family – It’s so fun to see where we were each year, and have a record of the people we love as well. My husband and I both have large extended families that we don’t get to see very often – but the exchange of Christmas cards every year keeps everyone connected and informed, so we can right up again when we do see each other. My young children love to see cards from people they know, but they also pore over cards from people they haven’t met yet, which sparks tons of questions: how did you met this person? Was I born yet when you were their friend? Is that really snow? (ha! Arizona kids) I think it’s so important to broaden my kids’ horizons and recognize the many walks of life outside our little home. Holiday cards make the relationships I have more meaningful, and they help my kids recognize how we are connected to other families around the country, and even around the world! 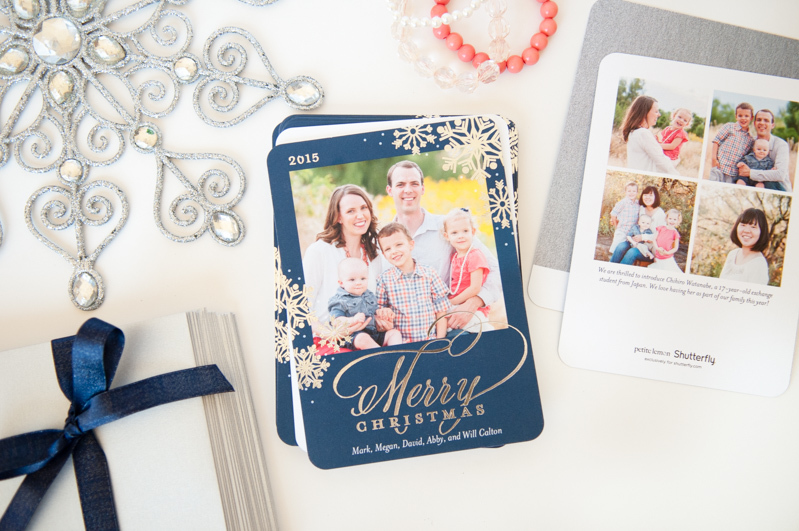 This year, I designed our cards with Shutterfly, and they are beautiful! There are so many card designs at Shutterfly – whether you like classic, nature-inspired, contemporary, or whimsical, there are TONS of options! I love that I can sort the cards by different factors like format, theme, style, color, and number of photos, depending on what I have each year. It makes it easy to find the perfect card for me, so that I don’t have to spend hours scrolling through options. Last year I did gold-foil cards, but this year I liked the silver foil-stamping with my photo! 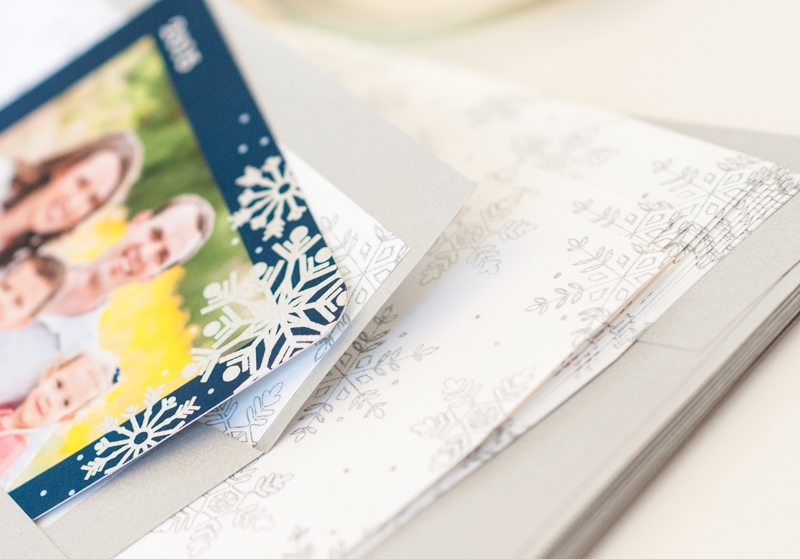 I’m seriously crushing on the silvery envelopes and snowflake liners…they are so pretty together! Add in pre-printed address labels and I’m totally sold on Shutterfly. I’m all for easy, beautiful stationary items that coordinate! Now here’s where Shutterfly came in to save the day. The photo I wanted to use was taken over the summer. I knew we didn’t have time to take a new picture, but the one I wanted looks very summery with coral, green, and bright yellow! I didn’t want the traditional red & green color scheme of Christmas cards to clash with our bright shades, but I still wanted our card to look appropriate for the holidays. 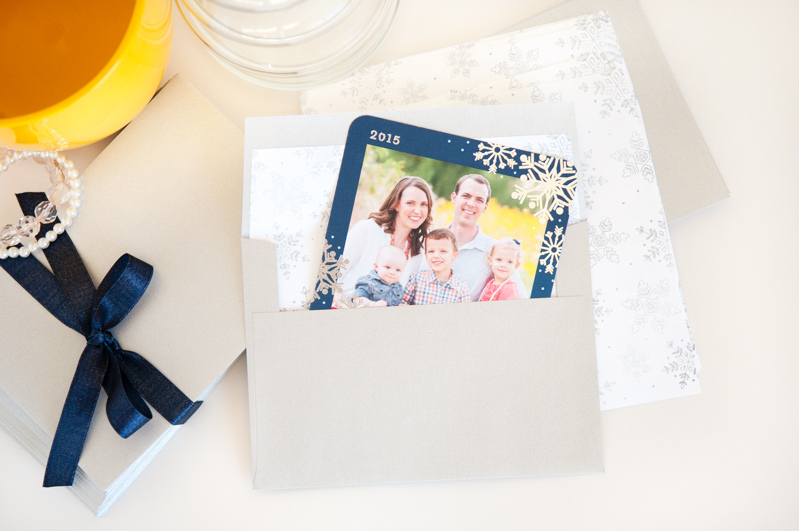 Never fear – Shutterfly has plenty of options that can “winterize” any family picture, and bring just the right amount of holiday cheer to your card. 1. Choose great holiday details. Things like gold/silver foil greetings, sparkly snowflakes, holiday berries, ribbons, monograms, and festive greetings make all the difference. Shutterfly has tons of options in all kinds of style, that bring just the right amount of cheer to your picture, even if it’s summer. I picked this one with silver snowflakes and a foil greeting, but there were tons of other templates that could have worked. 2. Pick the right color scheme! You don’t have to stick with the traditional red and green if you don’t want to… especially if it will conflict with your clothing! 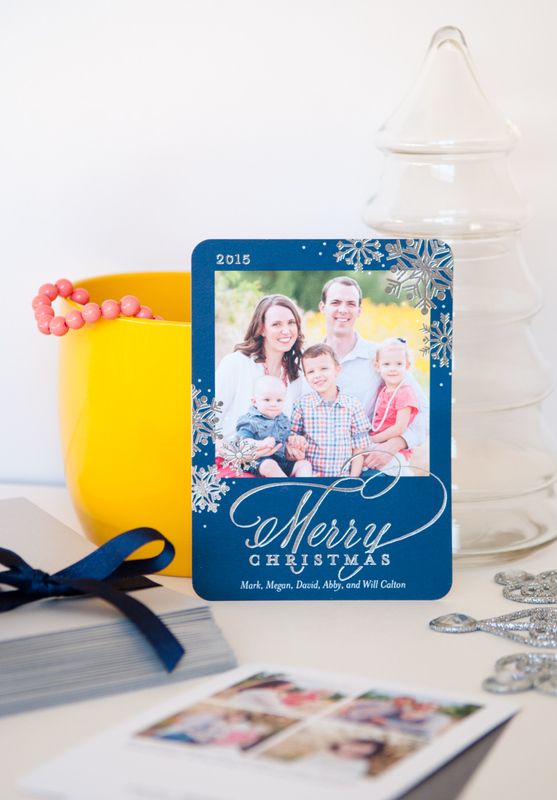 If you’ve already added the right details, then get the perfect shade for you card with Shutterfly’s Custom Color Palette, where you can customize certain elements to any shade you’d like! Need a minty green or perfect plum? Just click the box for custom color palette at the bottom of the filter area, and you’ll get more than 75 options you can customize. I love the navy & silver as a classy color combo for the holidays: it doesn’t conflict with our summer clothes, and really lets my photo shine while still feeling festive. Try it out! 3. When in doubt, change your photo to black and white and choose whatever template you would like! Sometimes this is the best option if you’ve run out of time. Grab a candid photo from home or vacation – it doesn’t matter if everyone’s clothes matches, because the black & white picture pulls it all together. This works especially well if you don’t have one group picture of everyone, and you’re combining pictures of people from different days. 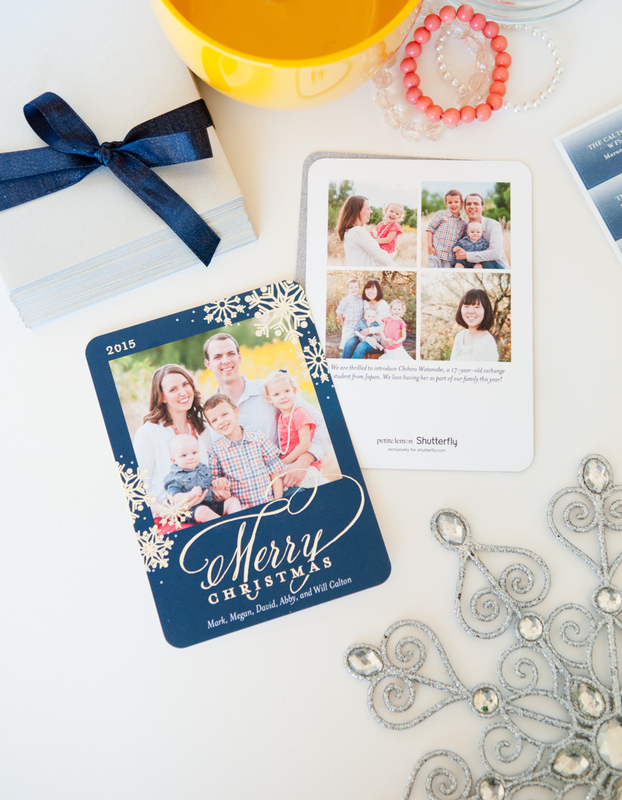 You can adjust your pictures to black and white in Shutterfly really easily, and it gives you the freedom to choose any card template you want. You might have noticed an extra face on my card… We are currently hosting a foreign exchange student this year, which has been such a good experience for our family. She is from Japan, and truly, it has helped expand our horizons! We consider her a part of the family now, and definitely wanted to include her in our Christmas card. Shutterfly’s back-of-card designs proved the perfect place to show off a few more family photos, and introduce our exchange student. I just dressed everyone up in their picture day outfits and snapped a new photo of all my “kids” together – I love it! 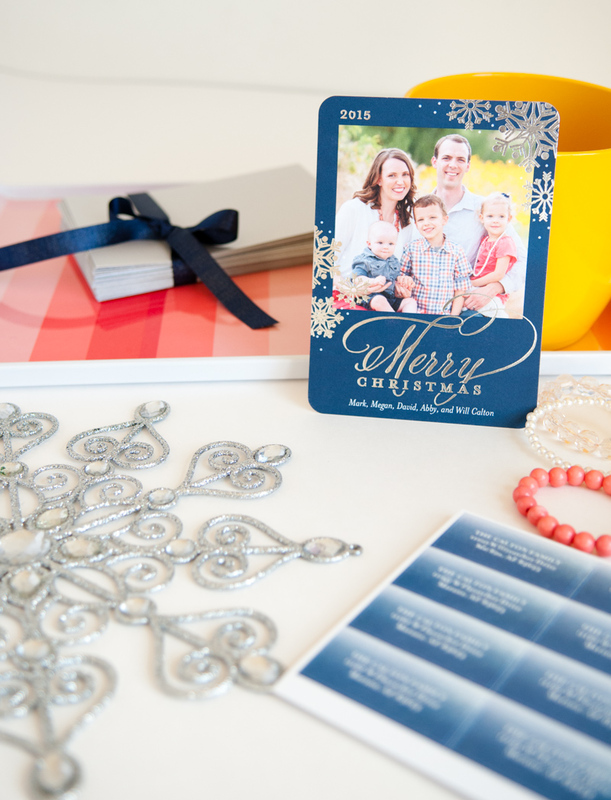 I feel like back of the card is where I make a deeper connection with the family sending it – it’s where you get a glimpse of personality and emotion, instead of just smiling faces on the front. I love that Shutterfly gives you so many options for the back of the card, both with background designs and the number/layout of pictures. It’s the perfect place to add a candid shot and extra information about your family! 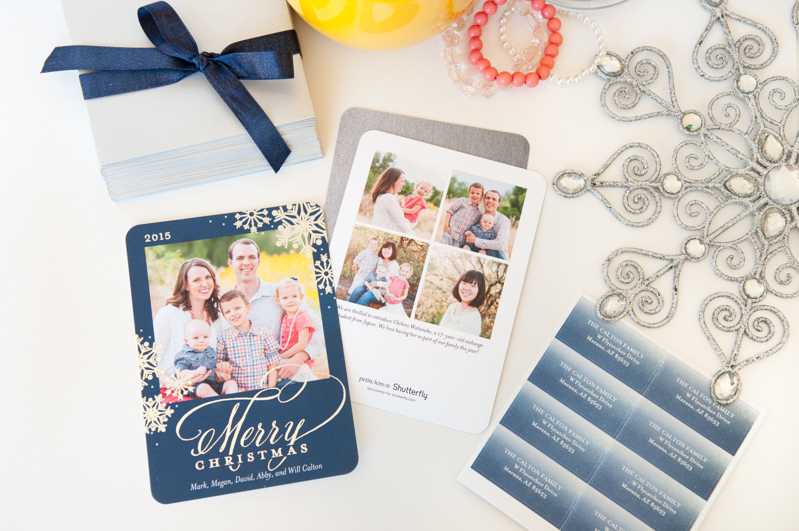 This post was sponsored by Shutterfly – Making more meaningful and deeper connections with family and friend this holiday season. Clever tips for photography! Good read. Great suggestion! This is exactly what I needed b/c our holiday photo was taken in August! Great way to “winterize” a card, as you’ve noted. Awesome! 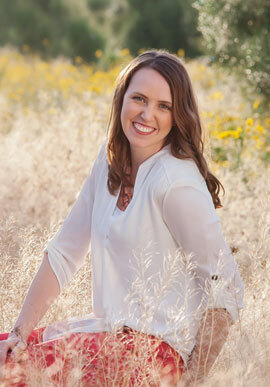 I love Shutterfly! I order a yearly photo book from there every year. Your Christmas cards look great! My husband and I have been talking about doing some for years, even if it’s an E-Card, but we still haven’t gotten around to it. You should totally do an e-card! It’s the thought that counts. I love the black and white tip – so smart!